We like to listen to Nature sounds from a box as we go to sleep. A “sleep phone” from SleepPhones.com, is a kind of headset for people who want to listen to something without disturbing their partner and without uncomfortable ear buds. Described as “pajamas for the ears,” Sleep Phones are basically a headphone wrapped in fleece. Currently, they connect to your phone with a wire, but a wireless version is coming out in April. We saw them for $30 at discounters. 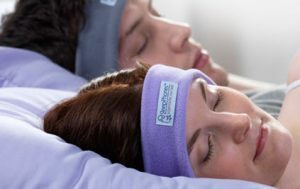 I believe I answered an email you sent and ordered SleepPhones. In the email, there was a download for 3 things: 1) 90 mins of Restful/Sleep? (I can’t remember the exact title), 2) 10 mins to listen to when you first wake up and 3) 20 or 30 mins (I think) for a Power Nap. I downloaded those 3 things but when I tried to open them, there were only jumbled letters, no music. So I trashed them and they are gone. Is there anyway to resown load those and also get the back-up CD? I contacted the Website for SleepPhones but they never offered those 3 things. I hope this reaches you and that you are the one to help me!